Hi everyone! I’ve had a lot of requests to see what my 9th grader’s homeschool day looks like. So today I’m sharing her schedule with you. Keep in mind, this is a flexible schedule. Some days a subject might take her longer than others. And so she may finish a little earlier, or later depending on her workload for the day. She currently has an average of 4-5 hours of school per day, plus extra curricular activities in the afternoons. So far this schedule is working well for her. For High School I give her about 1 hour per subject each day, and she is doing each subject daily. I also have homework listed on her schedule, and some of you are probably wondering about that since we homeschool. She has daily homework from our Options program along with studying for tests and doing extra projects not done during class time. So she uses her homework time to work on those assignments. Homework: English, Foreign Lang., Art and Computers – homework for each done during the week at home. –>> If you’d like to see what specific curriculum she’s using this year, make sure to check out our 2017-2018 9th grade curriculum post! Strawberry Shortcake also participates in our weekly options program and this year she is completing English/Literature, Foreign Language, Computers and Art there. 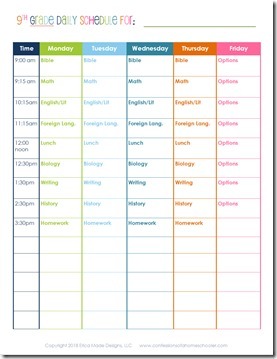 She does have homework for all of those subjects typically and so that is planned into her schedule above as well. 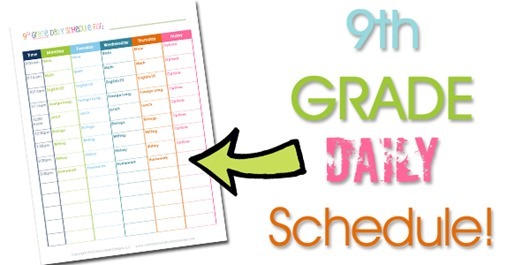 Check out our other homeschool daily schedules here! These are just the basic schedules that have worked for us over the years. Of course your schedule will vary based on the curriculum you’re using, and what fits the needs of your family best. 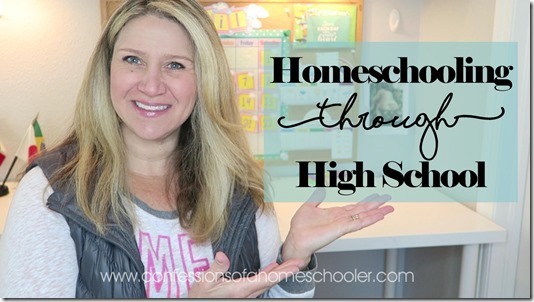 For more help on Homeschooling High School see these! How do you do art and computer, what curriculum do you use for art and computer? What time are you usually done with school for your nine grader that includes with them studying? Right now she is doing Art and Computers/Programming through our options program. There are several online options for computers though. Udemy has a ton of programming/computer related classes along with many other subjects. And Atelier Art and Home Art Studio DVDs are also great art alternatives. Its a great article!This will definitely help in making a schedule for all grades. I have been also trying to make a schedule for 8th grade. This can help in maintaining schedule in proper way.Thanks for such a wonderful information about making schedule.